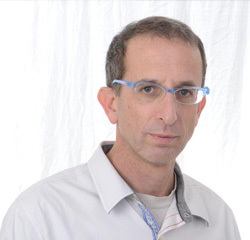 Dr. Ron Berger (born 1968) is an Israeli and British researcher in the area of International Marketing and Management focusing mainly on developing countries and B2B relations. He is the Assistant Dean at the College of Law and Business in Ramat Gan. He has published papers on emerging countries such as India, China, Russia and numerous Arab countries. B.A. from the College of Management (1993). Majoring in International Business and Finance. M.B.A. Huron University USA (1994). Majoring in International Business and Management. Berger’s research focuses on B2B Marketing, Business Ethics, and International Management. His main focus presently is in innovation and creativity in the above countries. Herstein, R., Drori, N., Berger, R., Barnes, B.R. (2017). “The Gap Between Theory and Practice in Private Branding Strategy Management: A Case of an Emerging Retail Chain”, International Marketing Review, forthcoming. Silbiger, A., Berger, R. Barnes, B., and Douglas, R.W.S. (2016). “Improving Expatriation Success: The Roles of Regulatory Focus and Burnout”, British Journal of Management. Berger, R., Silbiger, A., Herstein, R., and Barnes, B.R. (2016). “Developing International Business Relationships in a Russian Context”, Management International Review, forthcoming. Berger, R., Gavish, Y., and Herstein, R. (2016). “The Evolution of Management from a Trust to Arm’s Length Model in Family Run Businesses: The Case of the Diamond Industry”, Journal of Management History, forthcoming. Berger, R. and Gavish, Y. (2015). “A Gem in a Hostile World: An Evolutionary Analysis of the Diamonds Industry – The Case of the Israeli Diamond Industry”, Journal of Strategic Change Management, 6(3/4):268-291. Berger, R. (2015). “The Transformation of Chinese Business Ethics In Line With Its Emergence as a Global Economic Leader”, Journal of Chinese Economic and Foreign Trade Studies, 8(2):106-122. Herstein, R., Drori, N., Berger, R., Barnes, B.R. (2015). “Anticounterfeiting Strategies and Their Inﬂuence on Attitudes of Different Counterfeit Consumer Types”, Journal of Psychology and Marketing, 32(8):842–859. Berger, R; Silbiger, A., Herstein, R., and Barnes, B.R. (2015). “Can Guanxi be Created Between Western and Chinese Firms: Assessing Western Importers and Exporters to China on the GRX Scale”, Industrial Marketing Management, 47:166-174. Berger, R. (2015). “Mastering the Art of Jugaad A Western Guide to Business Practices in India and China”, International Journal of Asian Business and Information Management, 5(4):14-20. Berger, R; Silbiger. A., Herstein. R., and Barnes, B.R. (2015). “Analyzing Business-to-Business Relationships in an Arab Context”, Journal of World Business, 50(3):454-464. Berger, R. and Herstein, R. (2015). “Marketing Diamonds in China from the Perspective of International Diamond SMEs”, Journal of Small Business and Enterprise Development, 22(3):549-562. Berger, R. (2014). “The Enigma of the Chinese Diamond Industry”, Chinese Management Studies, 8(4):665-682. Herstein, R. and Berger, R. (2014). “How Companies from Developing and Emerging Countries Can Leverage their Brand Equity in Terms of Place Branding”, Competitiveness Review: An International Business Journal, 24(4):293-305. Herstein, R. and Berger, R. (2014). “Cities For Sale: How Cities Can Attract Tourists by Creating Events”, The Marketing Review, 14(2):131-144. Berger, R. and Herstein, R. (2014). “The Evolution of Business Ethics in India”, International Journal of Social Economics, 41(12):1073-1086. Berger, R. and Zwilling, M. (2014). “Ethics Of The Global Financial Crisis: Beyond The Washington Consensus”, International Journal of Accounting Practice and Research, 1(1):64-82. Berger, R. and Choi, J.C. (2014). “Network Interactions and Gift Giving: A Dual Sphere Model of Exchange”, Journal of Strategic change management, 5(3):219-229. Berger, R. and Herstein, R. (2013). “The Evolution of Chinese Business Ethics”, Management Research Review, 37(9):778-790. Herstein, R. and Berger, R. (2013). “Hosting the Olympics: A City’s Make or Break Impression”, Journal of Business Strategy, 34(5):54-59. Berger, R. and Zwilling, M. (2013). “Stake – Holder Marketing and Reciprocity in Eastern Europe: A Conceptual Analysis”, International Journal of Knowledge, Management and Learning, 2(2):175-190. Berger, R. and Zwilling, M. (2013). “Innovation, Learning, and Synergy Between Entrepreneurs and Venture Capitalists”, International Journal of Synergy and Research, 2(2):91-106. Herstein, R. and Berger, R. (2013). “Five Typical City Branding Mistakes: Why Cities Tend to Fail in Implementation of Rebranding Strategies”, Journal of Brand Strategy, 2(4):392-402. Herstein, R. and Berger, R. (2013). “A Country as a Brand: Israel’s Evolving Branding Strategy”, Journal of Brand Strategy, 2(2):179-190. Berger, R. and Herstein, R. (2013). “Marketing and Non-Market Based Value Creation: Gifts and Guanxi”, Journal of Business Theory and Practice, 1(1):166-185. Berger, R. and Herstein, R. (2013). “Guanxi: The Evolutionary process of Management in China”, International Journal of Strategic Change Management, 5(1):30-40. Berger, R. and Herstein, R. (2013). “China’s Social Market Economy: The Leverage of Economic Growth”, International Journal of Asian Business and Information Management, 4(1):21-31. Herstein, R. and Berger, R. (2013). “Much More than Sport: Sport Events as a Business leverage for Re-branding Cites”, Journal of Business Strategy, 34(2):38-44. Herstein, R, Jaffe, E.D., and Berger, R. (2013). “Forever Young – How Can a Branding Destination Strategy Rejuvenate a city Image? The Case of Tel-Aviv”, Journal of Urban Regeneration and Renewal, 7(3):211-233. Berger, R. and Herstein, R. (2012). “The Limits of Guanxi from the Perspective of the Israeli Diamond Industry”, Journal of Chinese, Economic, and Foreign Trade Studies, 5(1):29-41. Choi, C. J. and Berger, R. (2011). “Capitalism’s Global Financial Crisis: Re-Visiting The State and Industrial Policy”, Journal of International Business Ethics, 4(1):60-71. Choi, J.C., Berger, R., and Kim, J.B. (2011). “Globalization, Property Rights and Knowledge Networks”, International Journal of Technology Management, 56(1):53-72. Choi, J.C., Berger, R., and Kim, J.B. (2010). “Capitalism’s Global Financial Crisis: The Role of The State”, Social Science Journal, 47(4):829-835. Choi, C.J. and Berger, R. (2010). “Ethics of Celebrities and Their Increasing Influence in 21st Century Society”, Journal of Business Ethics, 91:313-318. Choi, C.J. and Berger, R. (2009). “Ethics of Global Internet, Community and Fame Addiction”, Journal of Business Ethics, 85:193-200. Choi, C.J., Millar, C., Ting-Jieh Chu, R., and Berger, R. (2007). “Increasing Returns and Marketing Strategy in the Twenty-First Century: Nokia Versus Microsoft Versus Linux”, Journal of Business and Industrial Marketing, 22(5):295-301. Herstein, R. & Berger, R. (2015) ‘Creating & Managing Brand Image’, Lambert Academic Publishing (in English). “MNCs, Global Financial Crises, and Human Rights: Beyond the ‘Washington Consensus” (with Choi. C. J. ), in Financial Crises: Causes, Management, and Economic Impacts in Nova Publishing, 2012. “The Global Financial Crisis: Re-Visiting Industrial Policy and Institutional Infrastructure”, in Financial Crises: Identification, Forecasting and Effects on Transition Economies”, in Nova Publishing, 2013. “Technology and Innovation: The Connection of Social and Technological Networks in China”, Technological Solutions for Sustainable Business Practice in Asia, IGI Publishing, 2015. “Responsible Leadership After The Global Financial Crisis: The Morality of Control and Self – Management”, in Global Financial Crisis: Causes, Consequences and Impact on Economic Growth, Nova Publishing, 2015. “The Bottom of the Pyramid Countries, MNCs and Human Rights: What Lies Beyond the Washington Consensus”, in International Human Rights and Justice, Nova Publishing, 2015. Barnes, B., Berger, R., Silbiger, A., Herstein, R. and Whitla, P. (2015) ‘Ethics and Diamonds: Paradoxical Issues Surrounding Guanxi Relations in China’ (Best Paper Category Award), Academy of International Business Southeast Asia Regional Conference, Penang, Malaysia, December 3-5. Berger, R., Silbiger, A., Herstein, R., and Barnes, B.R. (2017). “Is Guanxi Universal in China? Some Evidence of a Paradoxical Shift”, Journal of Business Research, forthcoming (IF 3.354). Berger, R., Silbiger, A., Herstein, R., and Barnes, B.R. (2017). “Developing International Business Relationships in a Russian Context”, Management International Review, 57(3):441-472 (IF 1.076). Silbiger, A., Berger, R. Barnes, B., and Douglas, R.W.S. (2016). “Improving Expatriation Success: The Roles of Regulatory Focus and Burnout”, British Journal of Management, forthcoming (IF 2.188). Berger, R; Silbiger, A., Herstein, R., and Barnes, B.R. (2015). “Can Guanxi be Created Between Western and Chinese Firms: Assessing Western Importers and Exporters to China on the GRX Scale”, Industrial Marketing Management, 47:166-174 (Citations – 2. IF.2.63). Berger, R; Silbiger. A., Herstein. R., and Barnes, B.R. (2015). “Analyzing Business-to-Business Relationships in an Arab Context”, Journal of World Business, 50(3):454-464. (Citations – 4. IF.2.68).